With preparations for the new Star Wars-themed land at the Disneyland Resort, excitement is spreading all across the galaxy! Construction for the new 14-acre land is set to begin in 2016, and guests will have to wait a few years before Star Wars Land actually opens, so young Jedi will have to exercise a lot of patience. 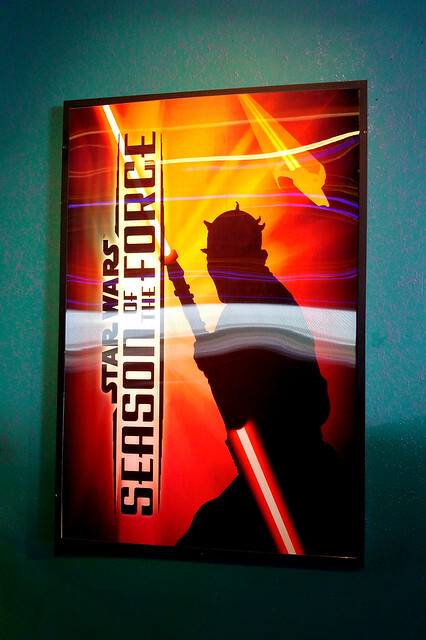 Fortunately, Disney Parks is making the wait easier with Season of the Force, a limited-time Star Wars themed experience in Tomorrowland. 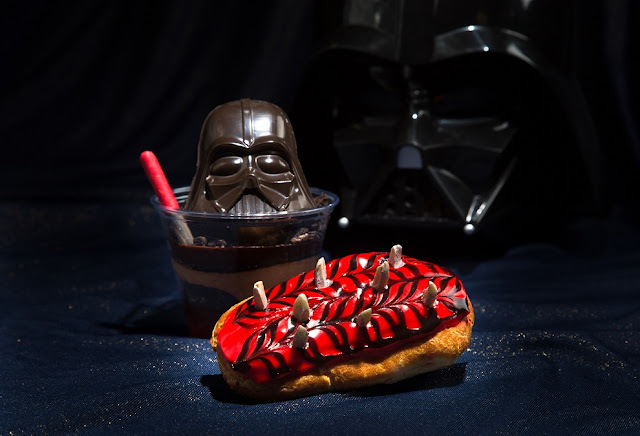 Not only do park guests get to enjoy new Star-Wars themed attractions, exhibits and merchandise, they also get to eat Star Wars-inspired food and beverages. That's right, foodies and Star Wars fans! You no longer have to travel to a galaxy far, far away to get some Cantina grub. 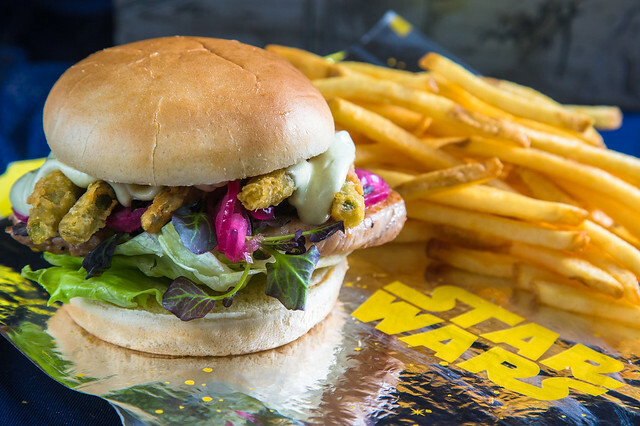 Disneyland's Tomorrowland Terrace has been transformed into the Galactic Grill, with a completely new menu featuring Star-Wars inspired dishes with clever names and delicious ingredients. 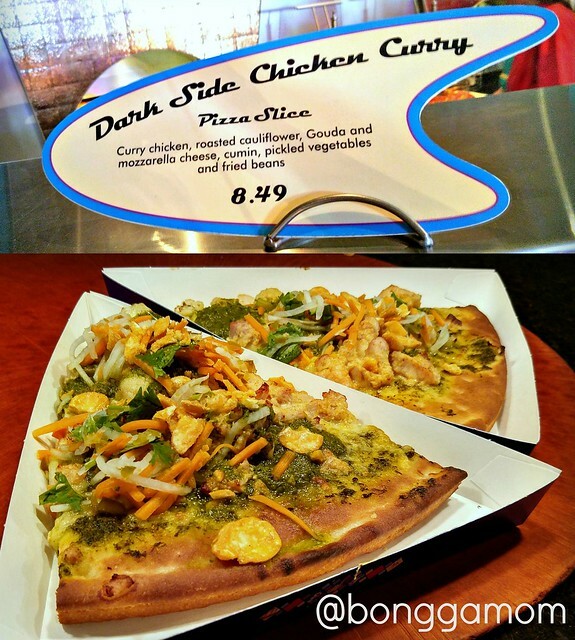 Redd Rockett's Pizza Port and Tomorrowland food carts also have their own set of Star-Wars inspired dishes. 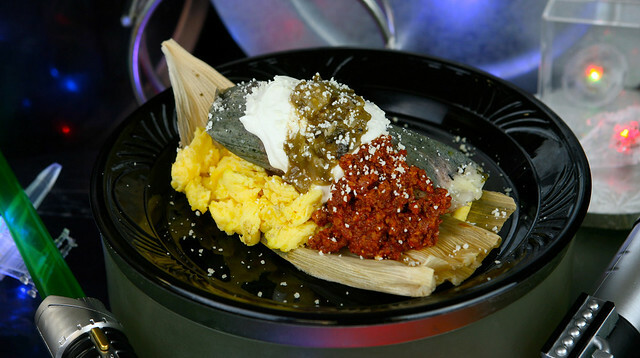 Wake up to the spicier side of the force with this blue corn Darth Tamale, with scrambled eggs and chorizo, red chili sauce and tomatillo. Available at the Galactic Grill. Other breakfast items not pictured here include Bantha Blue Milk Bread (french toast dyed blue), Lars Family Breakfast Platter (traditional bacon and eggs breakfast platter), and Moisture Farm, a fresh fruit platter. Kid's breakfast plates include Baby Bantha Bread (kid-sized portion of the Bantha Blue Milk Bread), and Padawan Breakfast Plate (kid-sized portion of the Lars Family Breakfast Platter). Talk about joining the Dark Side! This burger has a patty of angus beef and chorizo, topped with fried cherry peppers and spicy-lime aioli on a dark bun. 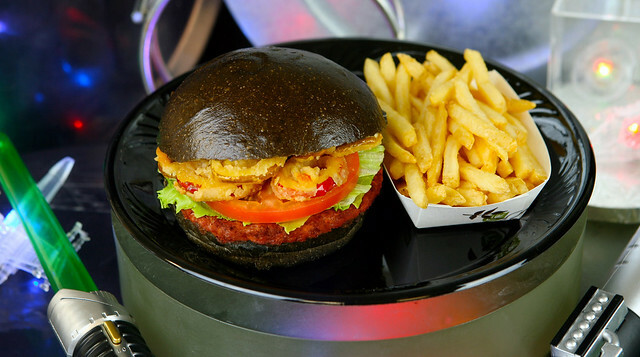 The black bun is actually more of a dark caramel brown color, and don't worry -- unlike the infamous McDonald's black burgers, it won't send anyone to the restroom! 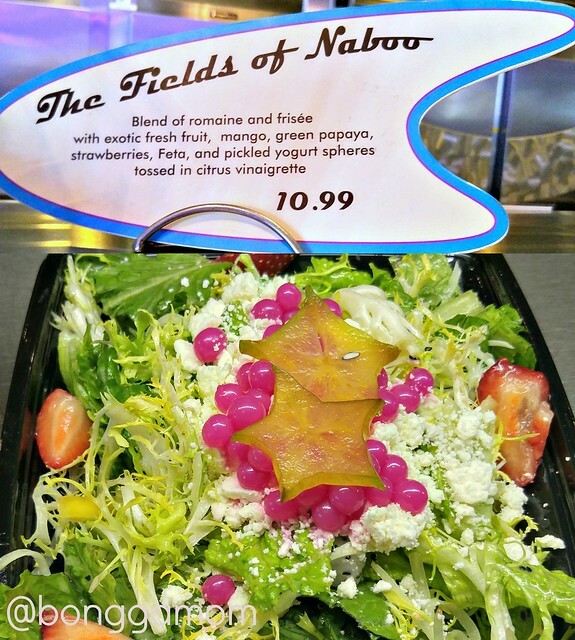 Available at the Galactic Grill. Five Spice chicken breast, fried green beans, pickled red onions, and watercress with wasabi mayo. Available at the Galactic Grill. This salad is so pretty!! The pink pickled yogurt spheres look amazing next to the yellow-green starfruit. The salad also contains romaine and frisée lettuce, mango, green papaya and strawberries, feta cheese. It is drizzled with a citrus vinaigrette. Available at Redd Rockett's Pizza Port. 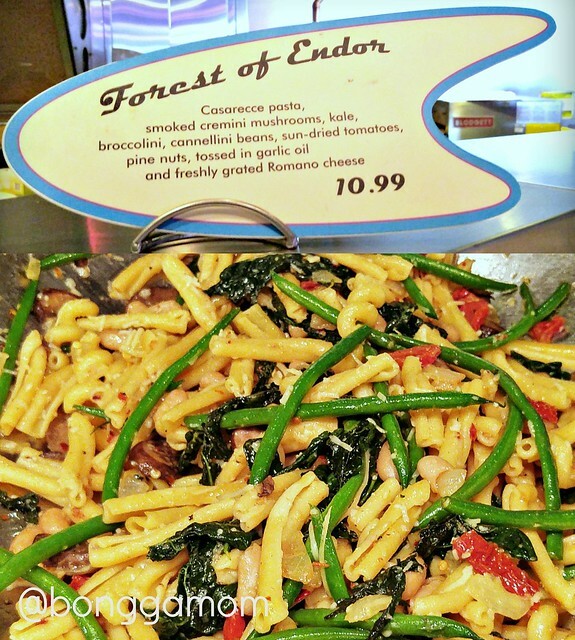 A Casarecce pasta dish packed with assorted veggies such as smoked cremini mushrooms, kale, broccolini and sun-dried tomatoes, as well as major flavor elements such as pine nuts, garlic oil and Romano cheese. Available at Redd Rockett's Pizza Port. We ordered this dish, and it was a nice change from our standard order of Chicken Alfredo Pasta. The sun-dried tomatoes really give it a nice, strong taste. Pizza slice covered in curry chicken, roasted cauliflower, gouda and mozzarella cheese, cumin, pickled veggies and fried beans, available at Red Rockett's Pizza Port. This pizza smelled sooooo good! I love how Disneyland isn't afraid to stray from the (boring) cheese and pepperoni pizza combo. That's why we love eating at Redd Rockett's so much! Other lunch and dinner items, not pictured here, include the Cheese 3Po Burger (cheeseburger), Wicket's Wicked Veggie Sandwich (portobello mushroom & veggie sandwich), and the Chopper Salad (chopped chicken salad). Kids' meals include the Jawa Turkey Sand-wich (turkey sandwich on blue-dyed bread! ), Han-Burger (mini burger), AT-AT Chicken Walker Nuggets (chicken nuggets), and Force Power Pack (yogurt and fruit). All kids' meals include sides and drinks. This was our favorite dessert, hands down. It's a classic cheesecake, infused with salted caramel and covered with chocolate frosting, piped to look like Chewbacca's fur. 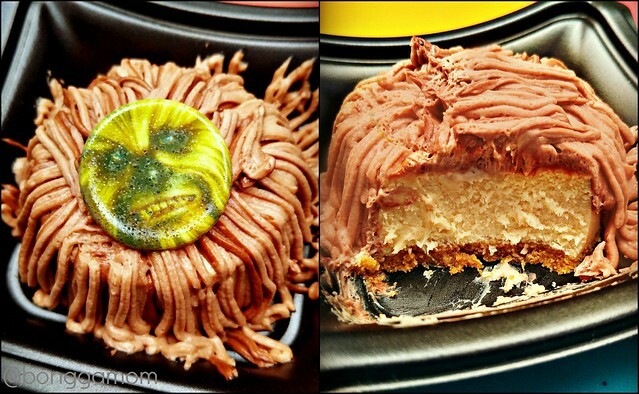 The cheesecake is topped with a white chocolate medallion with Chewbacca's face printed on it. The kids all said that they felt gross eating Chewbacca's face, but strangely enough, that didn't actually stop them from shoving that cheesecake down their mouths. I have a sneaking suspicion that this chocolate parfait is last May's Captain America parfait, with the chocolate Captain America shield replaced with a dark chocolate Vader head and white chocolate lightsaber. Not that I'm complaining -- I'm perfectly happen for Disney to repurpose this dessert so people can enjoy it longer! 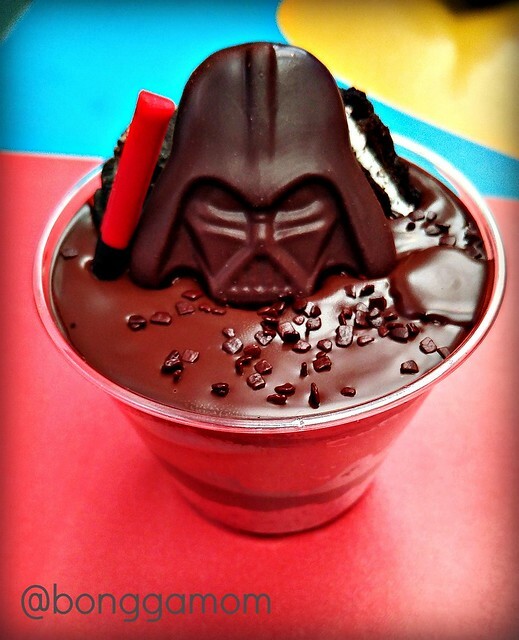 Darth by Chocolate is a dream dessert for chocolate lovers. It has layers of dark chocolate ganache, red velvet cake, and chocolate sponge cake, topped with crushed chocolate cookies, chocolate sprinkles, and the aforementioned chocolate Star Wars garnishes. It's super rich and super super yummy! 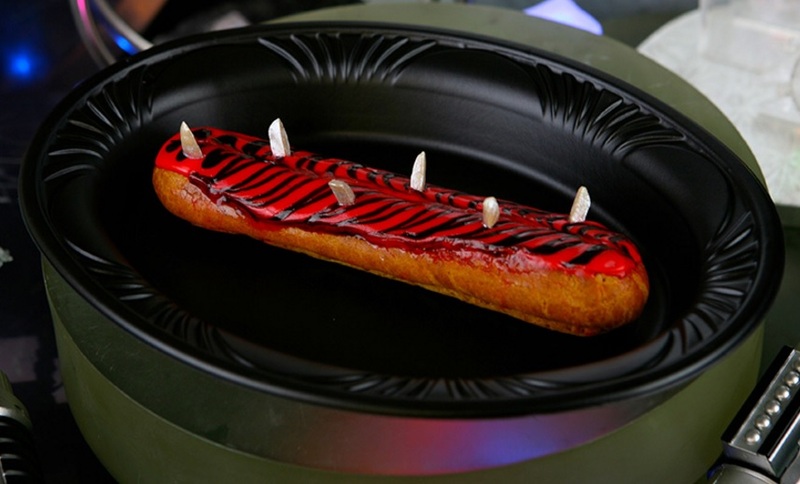 The Pastry Menace is an eclair filled with chocolate pastry cream, decorated to look like Darth Maul, complete with almond face spikes. Available at the Galactic Grill. 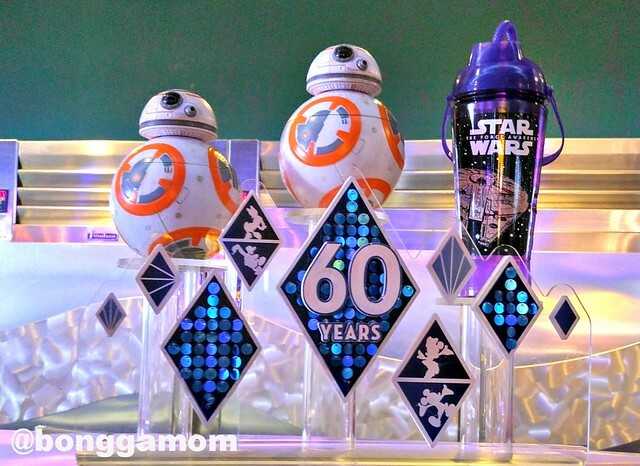 Not pictured here, the BB-8 Droid Crisped Rice Treat is a Kellogg's Rice Krispy Treat bar shaped to look like BB-8. The rice cereal is dyed orange to match BB-8's droid body, and the whole thing is covered with a white chocolate topping decorated to look like BB-8. 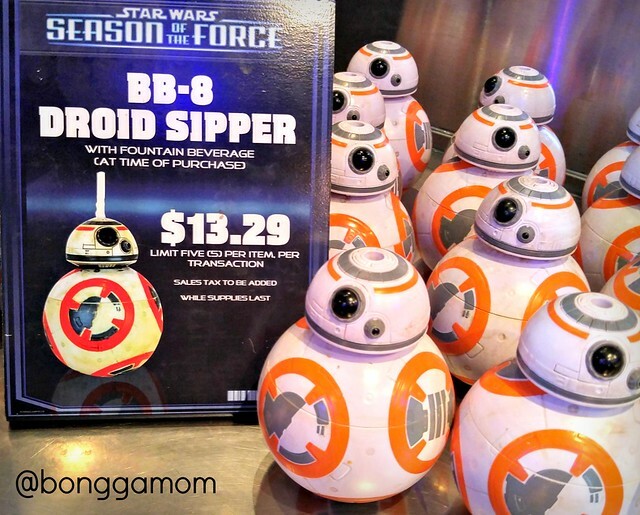 Guests can purchase a BB-8 Droid Sipper for their sodas at Red Rockett's Pizza Port. Sorry collectors and eBay sellers, you're limited to five of these per transaction! 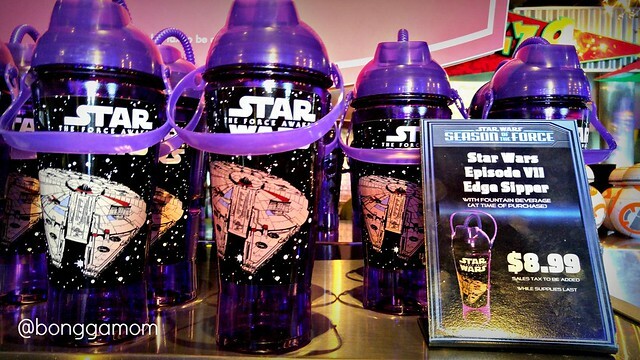 Other Star-Wars novelty food containers, not pictured here, include the black TIE fighter popcorn bucket, Chewbacca Beverage Stein, Han Solo Carbonite lunch box (for kids' meals), X-Wing Fighter Light Up Clip (to clip onto your frozen lemonade), and Darth Vader head cotton candy bucket. Are there any other Season of the Force foods that I missed? And which ones are your favorite? Please let me know by leaving a comment below, or by tagging me, @bonggamom, on Twitter and Instagram! Disclosure: I received complimentary admission to Disneyland Park. The views and opinions expressed here are my own. Everything looks so fun!! What a treat! !